Add a spicy twist to traditional deviled eggs. Make ahead for picnics, appetizers, cookouts, tailgates and more. CUT eggs lengthwise in half. REMOVE yolks to small bowl. RESERVE whites. MASH yolks with fork. ADD cheese, mayonnaise, sour cream and green onions; mix well. SPOON 1 heaping Tbsp. yolk mixture into each egg white half. REFRIGERATE, covered, to blend flavors. 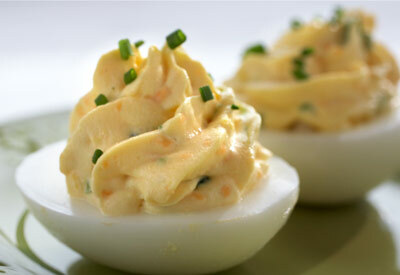 No-mess method: Combine egg yolks, cheese, mayonnaise, sour cream and green onions in 1-quart plastic food-storage bag. Press out air and seal bag. Press and roll bag with hand until mixture is well blended. Push filling toward bottom corner of bag. Snip off about 1/2-inch of corner. Squeeze yolk mixture from bag into egg whites. Picnic or tailgate tip: Prepare filling in plastic bag, as above. Carry whites and yolk mixture separately in cooler. Fill eggs on the spot, pressing filling out of snipped corner of bag. Save $1.00 on ONE Gain Liquid Fabric Softener 48 ld or higher (Includes Gain Botanicals) OR Gain Fireworks 5.7 oz or larger OR Gain Dryer Sheets 105 ct or higher. (excludes Flings, Liquid Detergent and trial/travel size).